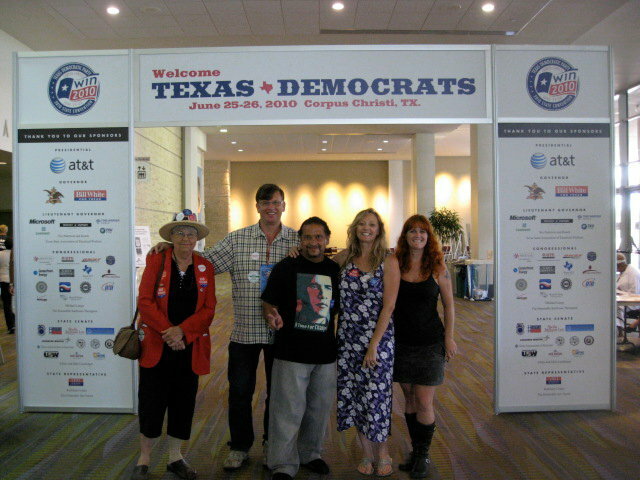 The Texas Democratic Party held its 2010 State Convention June 25-26 in Corpus Christi and adopted a party platform that endorses a moratorium on executions. The convention was attended by more than 7,000 delegates. The party platform has supported a moratorium in every platform since 2004. In addition to adopting a moratorium in the platform, the Resolutions Committee of the TDP State Convention also passed a resolution in support of a moratorium. Juan Melendez, an innocent person who was wrongfully convicted and spent 17 years on death row before being exonerated and released, was allowed to address the Resolutions Committee when it was considering the moratorium resolution. The photo at left in this post is of Juan addressing the Resolutions Committee. Click here to view the entire 2010 Texas Democratic Party Platform. Below is the language in the platform from the section on capital punishment. When capital punishment is imposed, Texans must be assured that it is fairly administered. Texas Democrats extend our deepest sympathies to all victims of crime and especially to the families of murder victims, and we strongly support their rights. The Texas death penalty system has been severely criticized by religious leaders, appellate courts and major newspapers that have observed that the current system cannot ensure that innocent or undeserving defendants are not sentenced to death. The Dallas Morning News has called for abolition of the death penalty in Texas. In the modern era, Texas has executed over 400 people, far more than any other state in the nation. The frequency of executions and inadequacies in our criminal justice system increase the likelihood that an innocent person will be executed. The State of Texas may have already executed at least two innocent people, according to major newspaper investigations into the cases of Carlos DeLuna and Cameron Todd Willingham. Another inmate, Ernest Willis, was exonerated and released from Texas Death Row in 2004 after 17 years of wrongful imprisonment. We condemn Governor Perry’s manipulation of the forensic science commission investigation of the science which led to the execution of a possibly innocent person. In order to promote public confidence in the fairness of the Texas criminal justice system, Texas Democrats support the establishment of a Texas Capital Punishment Commission to study the Texas death penalty system and a moratorium on executions pending action on the Commission’s findings. • reforming statutes related to the “Law of Parties,” to make sure individuals who actually commit crimes are the primary focus of prosecution. Here is a video of Juan Melendez speaking to the Resolutions Committee, followed by the Committee discussing the issue, and ending with several members coming up to Juan to offer him handshakes and hugs. Be sure to watch for the standing ovation given to Juan by the committee after his remarks and before they start discussing the issue. It was a very touching moment. On Friday at the TDP State Convention, Juan Melendez gave a 30 minute talk about his experience as an innocent person being sentenced to death to a meeting of the “Democrats Against the Death Penalty” caucus. Also speaking were Rep Lon Burnam, Judi Caruso, Jamie Bush who introduced Juan Melendez and Keith Hampton who dropped by to introduce himself to the caucus attendees. Keith is a candidate for judge on the Texas Court of Criminal Appeals. The caucus was founded in 2004 by Scott Cobb of Texas Moratorium Network. 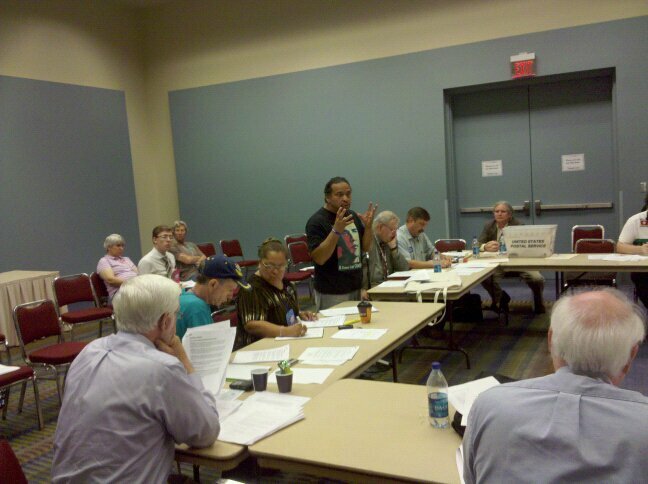 Juan Melendez’s appearance at the TDP State Convention was organized by Texas Moratorium Network and supported by Witness to Innocence, which made it possible for Juan Melendez to fly to Texas for the convention. Here is a video of Juan talking to a local Corpus Christi news team. Juan also spent a lot of time at the convention talking to people who came by the booth of Texas Moratorium Network in the exhibition area. 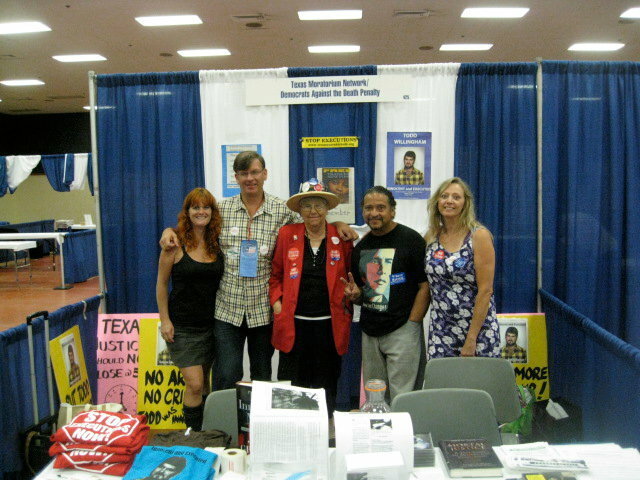 In the photo below are Jamie Bush, Scott Cobb, Alison Dieter, Juan Melendez and Judi Caruso – the Texas Moratorium Network/Witness to Innocence team at the convention. Sherri Clausell and Angie Agapetus, two anti-death penalty activists from Houston, also attended the convention. Link to news coverage of Juan Melendez from KZTV.com in Corpus Christi.